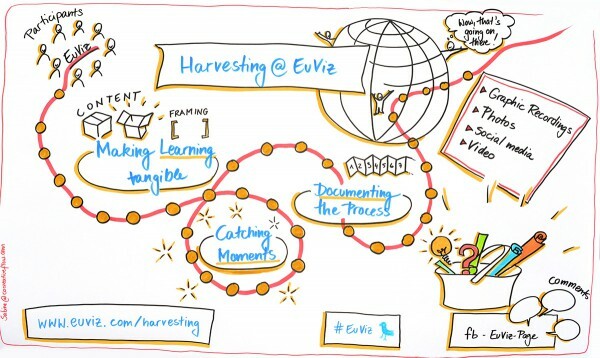 Visual practice and harvesting – it’s a match made in heaven! Images are one of our oldest forms of communicating and preserving experience and wisdom. Visual practitioners capture and work with images and symbols to help people in groups to collaborate better, and toremember and understand their work together. 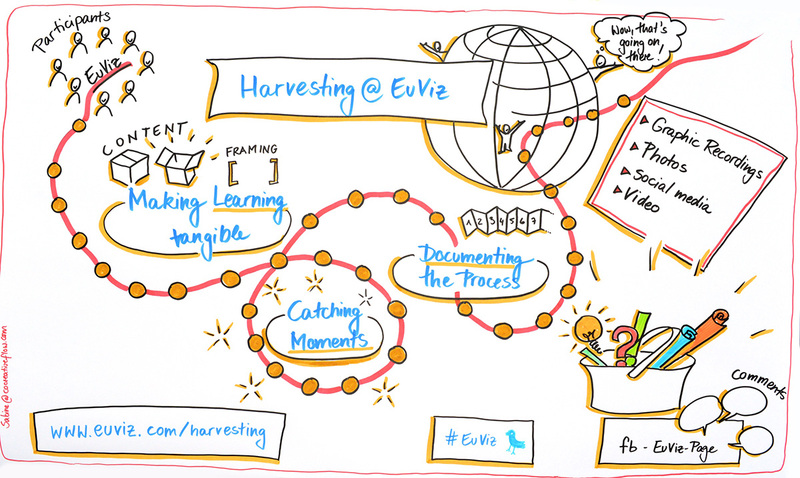 For EuViz 2014 we’re harvesting to help those who attended the conference to remember and enhance their learning and those who wanted to be here to join in the experience. We’re focusing on three important areas: making learning tangible, documenting the process and catching moments. We’re using graphic recordings, photos, social media, video and text to show you what we experienced, what we enjoyed and what we learned. So see what our agenda was for the day. Read a bit about how the day unfolded. See what we did. Hear from our session facilitators and participants. If you want to be reminded about why our programme was structured the way it was have a look here. Want the short version? See the whole conference in tweets here. We’d like to hear your voice too! Make your own comments on the EuViz Facebook page here. ¯\_(ツ)_/¯: @euviz HAUAHAUA sou eu do futuro falando, será?